Apple Cheese Cakes Take 1/2 lb of Apple grated 1/2 lb of lemon peel grated or a drop or two of the essence of lemon 1/4 lb of Butter, the yolks of 4 eggs and the whites of 1. 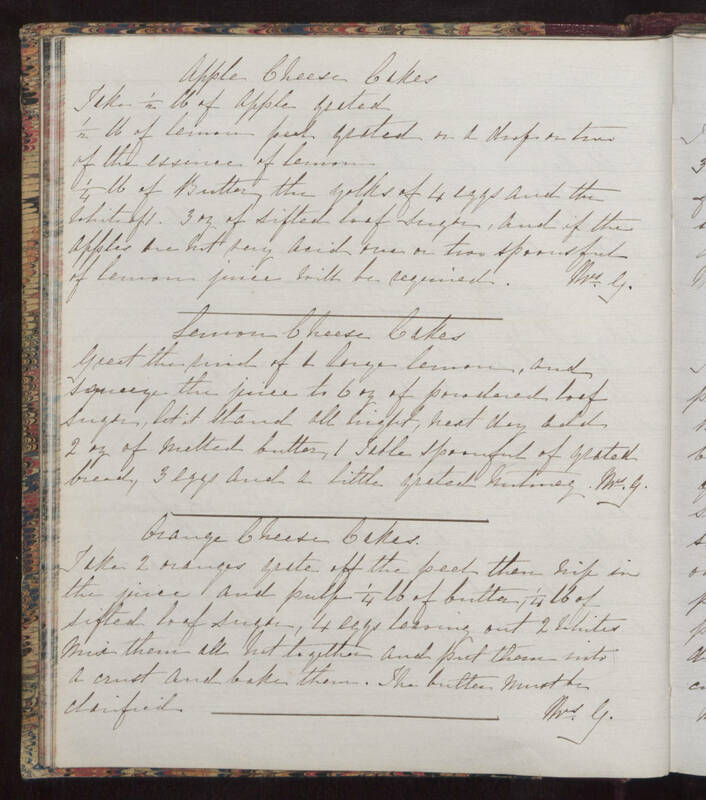 3 oz of sifted loaf sugar, and if the apples are not very acid one or two spoonsful of lemon juice will be required. Mrs. G. Lemon Cheese Cakes Great the rind of a large lemon, and squeeze the juice to 6 oz of powdered loaf sugar, let it stand all night, next day add 2 oz of melted butter, 1 Table spoonful of grated bread, 3 eggs and a little grated nutmeg. Mrs. G. Orange Cheese Cakes Take 1 oranges grate off the peel then mix in the juice and pulp 1/4 lb of butter, 1/4 lb of sifted loaf sugar, 4 eggs leaving out 2 whites Mix them all hot together and put them into a crust and bake them. The butter must be clarified. Mrs. G.